Beautiful textured stitches accented by cross-stitch flowers make this crocheted afghan a family favorite. Create five strips, join them together and embroider. A perfect companion to both formal and informal decor. 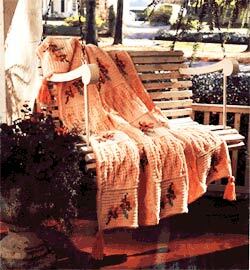 The approximate finished size of the afghan is 48" by 64". Size K crochet hook or size required to obtain given gauge. Note: Make sure Box 1 and 2 are the same size so they can be joined together. BOX 1: WITH A, CHAIN 27. Wrong side. Sc in first sc, * sc around post of next sc (called sc post—insert hook in space before next stitch, bring hook across back of stitch and out in space after stitch, draw up a loop and work off as a sc); repeat from * across, end sc in end stitch. Ch 1, turn. Repeat Row 2. Ch 2, turn. Note: On Row 2 and the last row a ridge is formed on the right side of work. Repeat Row 1. Ch 1, turn. and all even rows: 1 hdc in each st. Ch1, turn. Sc in each st. ch1, turn. Repeat between *** for pattern (from Row 2 of Box 1 to the first sc row of Box 3). Work even until there are 7 boxes in all — 4 Box 1 and 3 Box 2. End with last row of Box 1. Fasten off. Work first 2 rows of Box 1 of Strip A, then continue with Box 2 of Strip A. Alternate Box 2 and Box 1 as written for Strip A for 7 boxes in all &shy 4 Box 2, 3 Box 1. End last Box 2 with 2 rows of sc and 1 row as Row 2 of Box 1, forming a ridge. Fasten off. With A, right side facing, join at outer side edge corner. Work 1 row of sc along the side edge of strip, making sure work is flat. Ch 2, turn. Next row: Work 1 hdc around post of each sc, end with a hdc in end stitch. Fasten off. On corresponding side of same strip, work 1 row of sc, making sure to have same number of stitches as corresponding side. Fasten off. Work all strips in this manner. Follow chart for flower embroidery. Embroider a flower in each Box 1 in cross stitch. From wrong side with A, Slip stitch (slst) strips together loosely, placing an A Strip at each end and alternating other strips. Join B at a corner with a sl st. With right side, work sc around all sides of afghan, making sure work is flat and working 3 sc in each corner, with corresponding sides having same number of stitches. Join with a sl st.
Last round: Ch 1, with right side facing, working backwards from left to right, sc around all sides of afghan, making sure to keep work flat. Join with a sl st and fasten off. Cut 40 strands of color B, 12" long. Place a length of yarn in center and fold all strands in half. Knot length of yarn tightly around center. With a second length of yarn wrap several times around all folded strands 1" from top to form a head and tie securely. Trim ends. Fasten a tassel to each corner of afghan as shown.